Hezekiah Rhodes, a former oil company executive turned land developer and wood cutter traces his family roots to Ethiopia. 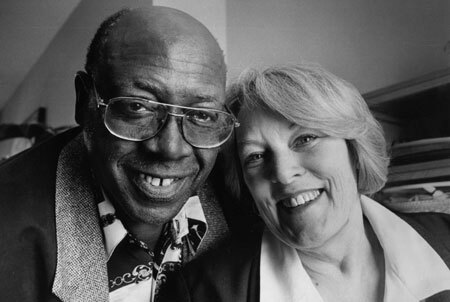 Hez's fiancee, Zena Joyce Parker, a Vancouver property manager was born in England. The fact they are of different races seems nearly unnoticeable because we first see the strength of their humanity and the magnetic dynamics of diversity expressed in a devoted loving relationship. Their commitment brings hope for our world as we struggle to accept one another. Today, when nations are rising up against each other, we must remember that our vast differences are just as important as our similarities. When we consider that our planet earth is both a spiritual and physical organism that protects and nurtures all diverse living beings, we can understand that all persons are loved equally by the Creator of Life.